In the time most expats spend in Moscow traffic every day, that expat could be near one of Europe’s great wine regions or certainly land in the world’s wine and gastronomic capital – Paris. Times of crisis create opportunities and this is definitely the time for the frugal wine lover to leave home. It’s a mystery why people who just six months ago would gladly pay twice today’s prices for a trip to Paris would hesitate to do so now. The Air France flight from Moscow to Paris cost just 11,500 rubles and there were just 12 passengers on the flight. I scored a nice room in sixth arrondissement (Paris has twenty arrondissement or districts) on Avenue de La Tour-Maubourg with time to fully explore the neighborhood. As an American who is dazed on each visit home by the range and assortment of produce, meats and wines at my local supermarket, Paris invoked a kind of “shock and awe” due to the assortment of luscious selections within a kilometer of my temporary home. Forgetting the hundred or so restaurants within a few blocks, the most intriguing find was a short block of shops: three cheese, four produce, three bakeries, two seafood, two butchers, a honey shop and other specialty food shops. And this wasn’t even a market. And then there were the other wine shops, boulangerie (pastry shops) and chocolaterie (chocolate shops) in the neighborhood. This was a visa trip, and in the past the Russian consulate in Paris (40, boulevard Lannes, 16th arrondissement) was a good and quick option. However, the rules have changed in the past year and unless you can prove you are a French resident, expect to wait two weeks (why not?). The Russian consulate staff are extremely polite and pleasant, but those are the rules. The consulate is open from 9-12, Monday through Friday. For this trip, we did some pre-research to identify some of the better-rated from the thousands of possibilities to enjoy food and wine in Paris. Make a reservation – despite the crisis, don’t count on a table at the better restaurants – make a reservation. Passport publisher John Ortega was in town for day one and we started with lunch at Le Dome, one of his favorites for seafood and a classic French restaurant directly at the entrance to the Montparnasse metro station. John suggested the Soupe de Poisson (fish soup), a superb heavy and savoury dark blended soup served with small toast rounds and a thick Provencal rouille sauce made from olive oil thickened with breadcrumbs and spices. The Sole Meuniere, prepared in clarified butter, was delicate and delicious after the ritual separation of the bones, head, tail and skin. For dinner John suggested this longtime favorite for genuine Mexican food, impossible to find in Moscow and rare in Paris. Anahuacalli is a Paris fixture founded by two expat Mexican women. We tried an assortment from the menu and, though the spices were toned down, the food was excellent. A rare ethnic treat in a city dominated by French cuisine. A recommendation of Philippe Der Megredichian, Moscow private equity executive and now Paris resident, he described this restaurant as a Novikov model, chic and trendy. When two dressed-to-the-hilt attractive ladies were seated next to us followed by Patrick Bruel, France’s current male pop superstar nearby, I knew exactly what he meant. A cozy if not sparse wine restaurant that exclusively offers wine/food pairings. Order a glass of wine and the chef prepares an appropriate accompaniment. The wines offered are worldwide and selected by Enrico Bernardo, one of France’s noted sommelier and the proprietor of Il Vino. A restaurant is about food while a wine bar emphasizes the wine, with food as a necessary accompaniment. A typical wine bar offers a limited menu to accompany a selected set of wines by the glass. Wine bars in Paris are not as extensive as one might expect. 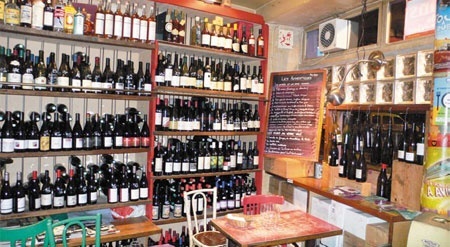 Le Verre Vole is a highly recommended small wine bar run by Cyril Bordarier. The ambiance reminds of a ‘60s coffee house with an eclectic set of about 24 chairs and nine tables surrounded by four walls of wine bottles and eight chalkboard menus. Thankfully, I got there early because the tables were entirely booked, marked with small Post-It notes. I managed to get a Plat du Jour (daily plate), just outstanding, with a series of glasses of white and red wines suggested by the server. The Plat du Jour consisted of Magret de Canard du Gers Sauce Sate with Haricots Verts Blancs Espanols (€17), tender sliced duck breast laid on large white beans. Recommended by Moscow investment veteran and Paris resident Joel Babb, he got us a reservation for an 8:30 seating despite the crowds. Set in a small comfortable space stripped down to it ancient brickwork and wood beams and trim, Fish offers a small menu with about five white and red wines by the glass. Entre+plat+dessert was €36.50 and wines ranged from €10 and up. Expat proprietor Tim Johnston offers a multi-national assortment of small plate dishes paired with an equally eclectic selection of wines: Australian Shiraz, California Zinfandels as well as French. He is a specialist at cigar/wine and spirits pairing. Unfortunately, Juveniles was full when I arrived. I’ll try next time. By the time I got to Les Papilles after leaving Juveniles, it was closing. Said to be run by two ex-staff of Taillevant, one of Paris’ top restaurants, this is another recommendation to try next visit. The shop is a sister establishment of Fish, and recommended Joel Babb. Proprietor Juan Sanchez is strong on wines from southern France (Cotes du Rhone, Rousillon) and hosts Saturday-afternoonwith- the-winemaker-wine tastings. This wine shop specializes in wines from proprietaires recoltants (winemakers who grow their own grapes), with emphasis on Burgundy. A three-floor expansive Paris extension of stores in Barcelona and Madrid with thousands of exceptional labels from more than 40 countries. Has a small restaurant with limited wine/food pairing menu. 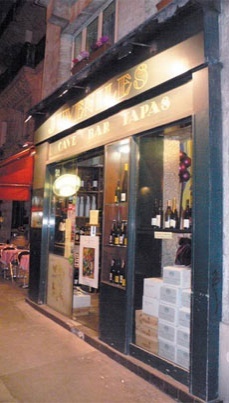 Another recommendation by Joel Babb, Vivin is a wonderful cave in the oldest building in Neuilly at the edge of Paris. Don’t bother with a car. Parking is impossible and Paris has a metro and bus system that rivals Moscow. Take a KLM bus from the airport (Eur 16.50) to the center and a taxi from there to your hotel. 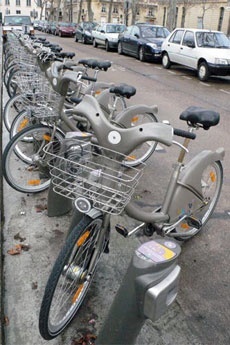 Bicycle rentals – Paris has a Velib rental program with hundreds of automated service points around the city. Pick up a bike and return to another Velib point within 30 minutes. A daily pass costs €1 and a weekly pass €5 for an unlimited number of 30 minute rides. Don’t wait for the airport to buy wine – the selection is poor and the price points tend to be high. Some Paris wine shops have a special shipping box that well-protects bottles for check-in. Twelve bottles should still weigh under the airline 20kg limit. Food delivery – Paris is big on delivery. You can arrange delivery from everything from small shops to Auchan. Dogs –don’t be surprised to see a dog under a table at even the best Paris establishments. Also, watch your step on the sidewalk. Japanese food – Paris has its share. If you hanker for sushi or udon or other Japanese try Rue Sainte-Anne where there are a dozen or so Japanese restaurants. From the lines in front it looks like Higuma or Kunitoraya are good bets. Google Street Walk – Paris is fully covered so you can take a walking tour from home of virtually every street – look up, down, ahead and behind and get an idea about where you are headed before hand. Watch your bags especially in busy tourist areas. Paris has a very sophisticated street crime establishment.